See this family above? See how happy they are? They are eating out. In a restaurant – a PUBLIC restaurant. They are enjoying themselves, that’s clear, and they seem relaxed (there’s no frantic wolfing-down of meals , or a Peppa-laden iphone being used as a distraction technique. I’m guessing there’s no lumps of sandwichy mush on the floor or even the table (I mean – look at how white the tablecloth is for starters? The FOOLS!) All in all, they’ve clearly got it sussed. Team Dunk ventured to the West Country for a week of holidayness, wine, sun and general merriment. On the recommendation of a good friend we spent day one at New Mills Farm Park, near Launceston in Cornwall. 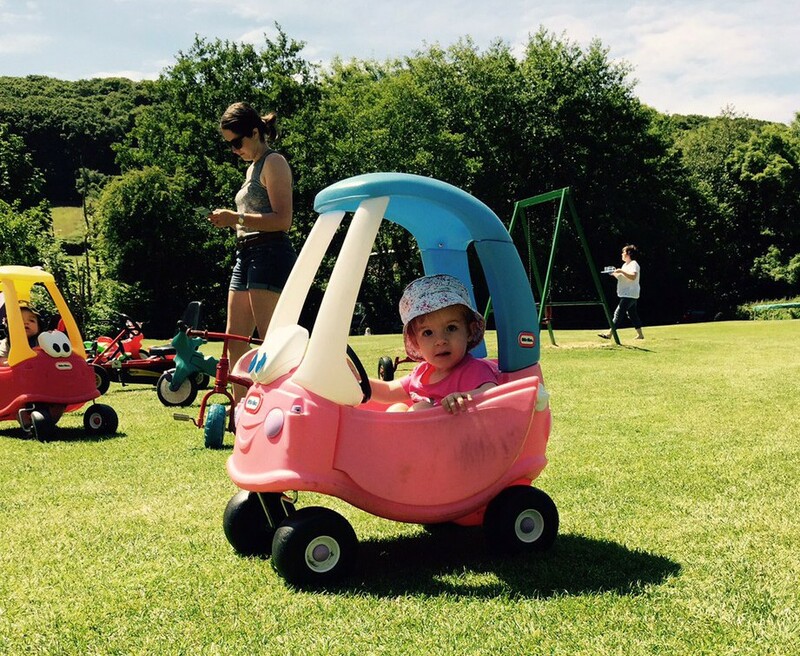 The place is gorgeous – a family run, inexpensive day out with a huge sandpit, trampolines, zip wire, swings, slides, miniature diggers and a shed load of toddler ride-on toys. Bear was in her element given the number of Little Tike Crazy Coupé cars (she loves them more than Mummy and Daddy half the time), the sun was shining, there was ice cream, we were happy. The farm is also home to some animals, clearly. Miniature ponies, rabbits, guinea pigs – all cute and cuddly in their little pens. 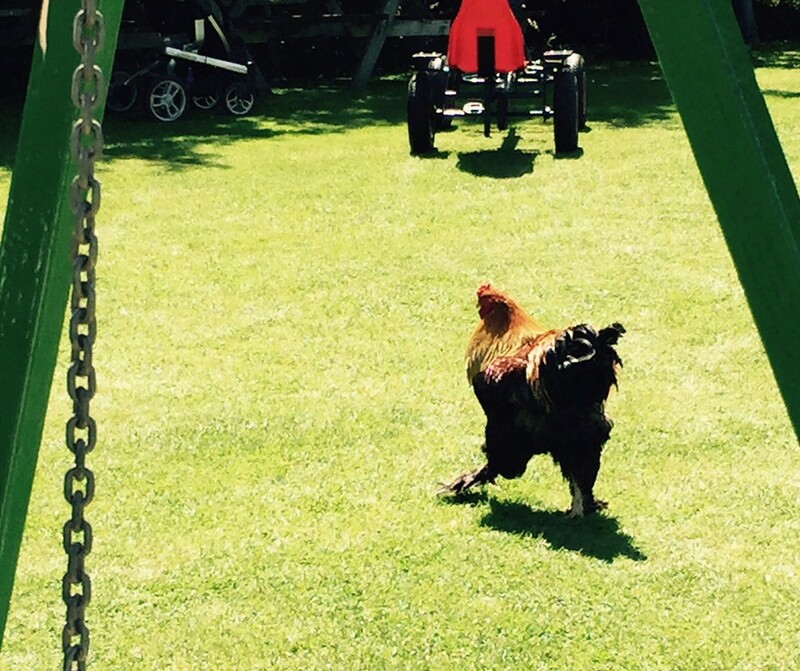 It’s also home to some free range chickens and a peacock, just roaming around. And so the lunchtime fun began. The place is huge. There are LOADS of picnic benches, and so we settled at ours. By ‘settled’ I mean we did our level best to blackmail Bear into the highchair. Blackmail in the form of a biscuit seemed to be well-received, but she wanted to sit in the Crazy Coupé car that she was guarding with her life (there were 8 others, all unoccupied, but there’s no point trying to explain that to her.) Fine. In her car she goes, and over walk half a dozen chickens hell bent on having her biscuit. It’s a large place, as I say, but most people heard the screams that day when cluck-clucking chickens came up against a biscuit- and car-crazed toddler. She scrambles out of the car and throws herself on the ground in a panicked frenzy. Paul scoops her up, I shoo the chickens away by clapping (later I would wonder if they took this as a round of applause), and suddenly the high chair seems like a safe haven. All of this went on before the food arrived. When our meals came, one thing was clear; chickens in that part of the world aren’t half partial to a Ploughman’s. The next 10 minutes were a blur. Word had got out among the chicken community that a decent lunch had been served, and they all brought their mates over for a piece of the action. They’re under the bench, they’re trying to have a go at my feet (now seems as good a time as any to share the fact that I HATE people – or chickens – going near my ankles, so this was pretty hellish). Bear has shunned the highchair completely by now, and is sat on Daddy’s lap while he attempts to cut a Cornish pasty with one hand. Any stray bit of sandwich or cucumber that Bear launches from the table is attacked by the chickens like it’s the first and last thing they’re going to eat this year, and as long as there’s a chicken in sight (and there were, trust me), she’s going bonkers – wriggling, whinging, and basically the total opposite to the aforementioned photo above. Then over walks the peacock. All this space and the damn peacock wants to join us for lunch now, too. Excellent. Then the Head Chicken (affectionately known as MC Hammer chicken) lays into the peacock, the peacock starts squawking a sound like no other, Bear’s going mental yelling “kangaroo! Kangaroo!” (it was definitely a peacock), I’m still applauding the sodding chickens who remain focussed on both my Ploughman’s and my flip flops, there are chickens trying to get ON the table, Paul’s one-handed pasty-eating progress is SLOW, and by this stage of the game he and Bear are also joined on their side of the table by an old cat. He’s about 3 inches from Paul, just staring at his pasty. We’re stressed. It’s like Animal Farm meets an alien invasion, only with more poultry. 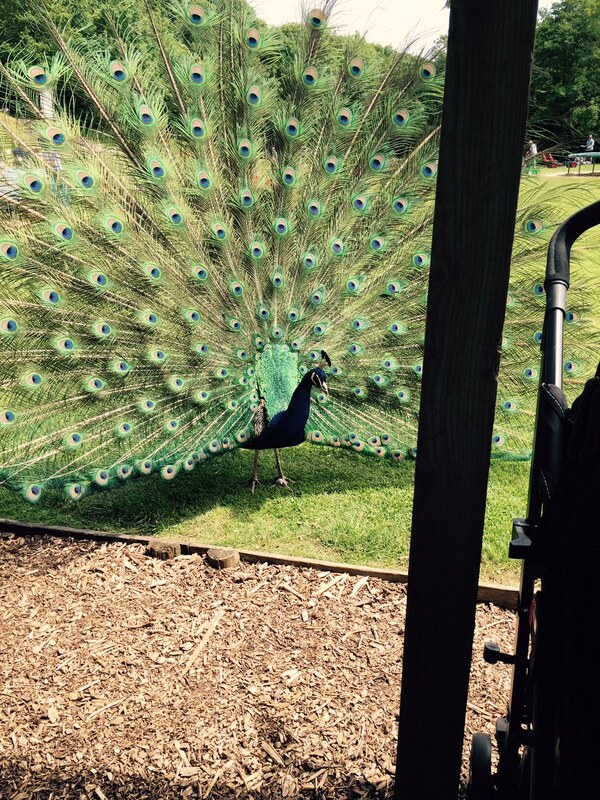 Now, there’s a time and a place for showing off, but Mr (or Mrs) Peacock – here’s a little tip for you. That moment there, when we’re fending off chickens and trying not to make eye contact with a random cat, was NOT the time nor place to do your fancy and flouncy feather display. Like a massive Can-Can dancer this thing paraded its feathers, all “look at me!” then starts squawking again. Bear’s crying, I’m not far off, Paul’s still trying to eat his pasty before his cat allergy kicks in, the chickens are clucking away, pigeons are gawping at the commotion, and the cat’s still staring. All in all, we’re having a really lovely, relaxing time. If anyone took a photo of us at lunch that day, it couldn’t be further from the smiley, relaxed scene in these unrealistic stock photos you find on the web. New Mills Farm Park was lovely though; really good day out (aside from the frenzied lunch). And if anything, it’ll make you appreciate your roast chicken dinner all the more when Sunday rolls around*. You can find Chatterbox Mummy on Facebook. Oh yeah – can you imagine!? No doubt a second child would be sat on MY lap, so either my feet or my food would have come a cropper!